Winter is in full effect and with that comes the added bonus of colds, viruses and flus, the winter months freak me out! I can’t just open a window and let fresh air in without freezing my toes off which is a total bummer. Winter has done its job at putting all the trees and plants in hibernation and has forced me to fire up my furnace. Now that the dry heat is circulating throughout the house I knew it would cause problems with my kids. My furnace has a humidifier attachment, but it needs to be replaced so, my alternative was to go out and find me a new humidifier. It has 2 settings (low to high humidity)and an “off” option; a small medicine tray by the vent; a clear water container; it can run all night and day; and it has no filter! I have owned a few humidifiers over the years and I can honestly say I am in an extreme dislike for humidifiers with filters! They just end up so gross and there’s so much maintenance and cleaning with that extra step. Being a mom of 6, I don’t want to have to run to the store to constantly replace the filter… it’s just something I’m not into, so the no filter option was a major selling point to me. My 2 year old had a fever and a dry cough around the same time I bought the humidifier and I am proud to report he’s been having some great sleeps at night and is finally over his cold. 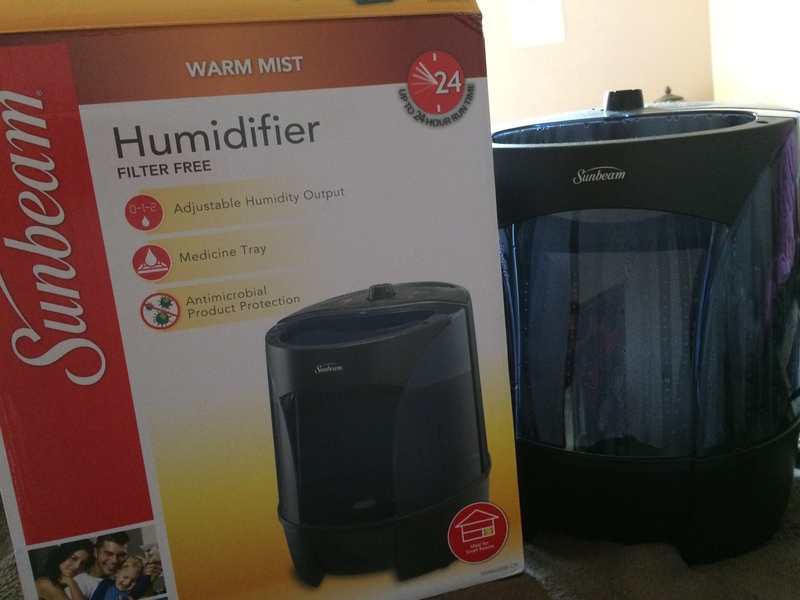 If you’re in need of a good simple humidifier try this one out. It was $34.96CAD at Walmart which is nice on the budget, has a great output and is surprisingly quiet.